Neighborhood’s Hollywood Road address is misleading. You can pace back and forth between the art galleries and antique stores and be none the wiser to the fact the entrance to the basement French-and-Italian restaurant actually sits in discreet Man Hing Lane off Peel Street. 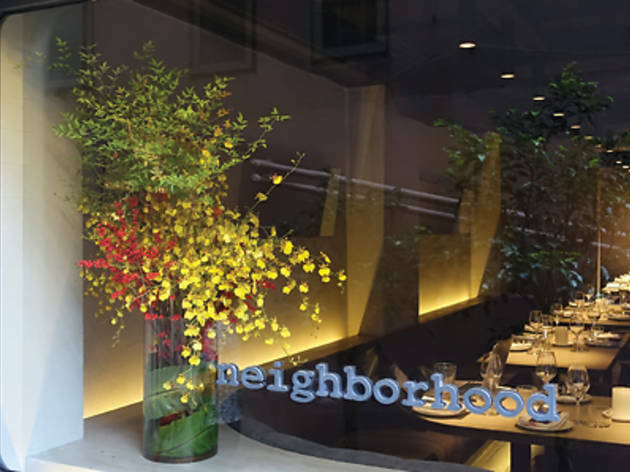 This lane houses cool-as-cucumber eateries like Les Fils à Maman and Neighborhood joins a little courtyard area as a congenial eatery with minimalist interiors alongside dominant white and grey slate tones. Like the decor, the cuisine also follows this concept of simplicity. The weekly menu is just one page long. We can only imagine how much toil chef and owner David Lai – of Michelin-starred Bistronomique – puts in to come up with a different food and drink list every week. We launch into our meal with a wagyu tartare garnished with fourme d’Ambert ($98) and we’re surprised how well the fatty meat works with the strong cheese – but, unlike usual tartares, it’s not served with any dough or starch to cut the richness, so we ask for extra bread, which helps us savour the finer notes of the traditional cheese. Next we plump for the wild boar garganelli ($135). It’s superb. The al dente pasta enhances the flavours of the fragrant game meat and is balanced well with fresh coriander. We can taste the raw quality of the ingredients. The bone marrow and kale risotto ($145) is also a winner. The creamy risotto encapsulates the equally smooth bone marrow perfectly and the Chinese kale stalks add interest to the texture – but, at this point, we begin to regret our choice of the chocolate palette ($70) for dessert as everything we’ve ordered is so rich. Although the 70 percent chocolate mousse tart is luscious, there’s no fruit or citrus flavours to balance it. And when we peruse the menu again, there’s no relief in sight at all. The only item that goes easy on the tum is the rocket salad ($98) – but even that comes with cheese. 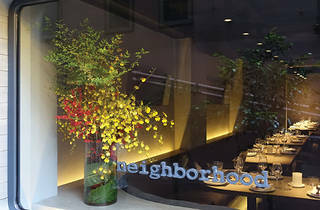 Neighborhood B/F, 61-63 Hollywood Rd, Central, 2617 0891; fb.com/neighborhoodhk. Dinner for two: $800.